Encoder Products Company (EPC) manufactures an extensive line of high performance rotary encoders and accessories, including the RX/TX line of signal conditioners, transmitters and receivers. EPC has expanded the RX/TX line with the release of the all new RX/TXD. Typically, encoders provide an output signal that feeds directly to a counter, controller, or other receiving device. However, some applications require additional measures to optimize the encoder signal for use. In such cases, EPC’s encoder signal conditioners enable customers to modify the signal by converting the output type, changing the voltage level or by splitting or repeating the signal. EPC’s new RX/TXD combines all of these capabilities into a compact DIN rail mountable unit, along with an encoder tester/verifier capability. In many retrofit or upgrade projects, signals from existing rotary encoders may need to interface with newer devices with mismatched input requirements. In these cases, the RX/TXD’s level changer/conditioner capability is ideal. For example, a 24VDC open collector output can be converted to a 5VDC RS422 compatible differential line-driver. When a single rotary encoder must provide signals to multiple devices, the RX/TXD can split one encoder signal into two or three identical outputs. This capability can eliminate the need for redundant encoders and also offers greater design flexibility. For encoder signals transmitted over long distances, the RX/TXD can be configured as a signal repeater, eliminating the risk of voltage drop and ensuring signal integrity. Also, the RX/TXD can convert open collector encoder signals to differential line driver output, a signal type better suited for long cable runs or for electrically noisy environments. The RX/TXD accommodates a variety of digital signal types (RS422, NPN, PNP, TTL, etc.) and voltages (5VDC or 6-26VDC) as both input and output options, allowing for use with all EPC rotary encoders as well as other brands. The all new RX/TXD housing incorporates several new features. 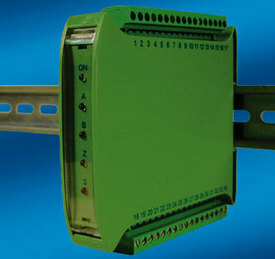 Compact and lightweight, the green PC/ABS housing is DIN Rail mountable, allowing for simple, flexible installation. In addition, a series of LED’s on the front panel indicates power and signal presence, enabling an encoder tester/verifier functionality. Finally, all connections can be made via easily accessible screw terminals. A versatile, multi-function solution for a number of common rotary encoder application challenges, the RX/TXD encoder signal conditioner is ready for shipment and offered within EPC’s standard 4-to-6 business day lead times. Covered by EPC’s industry-best 3-year warranty, the RX/TXD is available through EPC’s network of qualified distributors or through online purchase at www.encoder.com. A complete data sheet and installation guide are available upon request. Encoder Products Company manufactures a broad line of rotary encoders and accessories. The company’s products are widely applied by motor OEM’s, industrial machinery OEM’s and industrial end-users. Founded in 1969, the company is now the largest privately held industrial encoder manufacturer in the Americas. EPC operates three global manufacturing centers located in Sagle, Idaho, USA, Wrexham, Wales, and Zhuai, China. All locations supply products for their respective regional markets. For additional information contact EPC, PO Box 249, Sagle, ID 83860, 800-366-5412, www.encoder.com.